It's not completely accurate, she admits, but if you've ever wondered what it's like to sing choir in Hell, now you know. 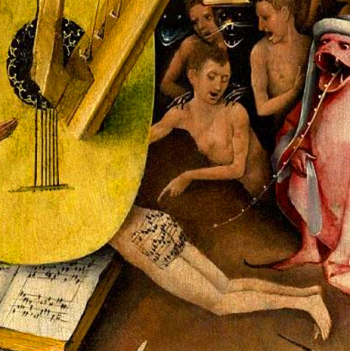 Hieronymous Bosch created his infamous triptych, The Garden of Earthly Delights, at the beginning of the 16th Century, and hidden away in Musician's Hell on the far right panel is a choral scene. The choristers, egged on by devils, are singing a chant with music seared across a poor sinner's arse. Amelia, a student at Oklahoma Christian University, noticed this and decided to translate the piece. Now you and all the world can find out what a tune sung in Hell might sound like, right over here. The Garden is one of this master-worker's most famous pieces, and currently is displayed at the Prado, in Spain. Paradise, with Adam and Eve and many other wonders is over on the far left of the triptych. The center panel is devoted to the Earth, while the far right depicts all the savagery of Hell. It's not the weirdest of Bosch's art by any means, and while his pieces tended to reflect the moral structure of his time, their surreal portrayal is inspirational to this day. The surrealists themselves - Salvador Dali in particular - loved Bosch's work. Nobody knows why Bosch painted this piece, though the accepted theory is that it was created for a patron's amusement - or edification - and not as a church altar piece. "I decided to transcribe it into modern notation," Amelia explains, "assuming the second line of the staff is C, as is common for chants of this era ... The last few measures are kind of obscured but I tried my best." The music translation isn't perfect, Amelia admits, and she's working with her university musical department to perfect it.